For small boats, passenger capacity is calculated solely based on the amount of weight your boat can carry, with the average person weighing 184 lbs. There is also a quick estimate to determine passenger capacity for smaller boats. While exceeding weight capacity is not a Federal Law, some states do consider it a violation, so please check your states specific regulations and laws. Do you know how many people you can safely carry on your boat? 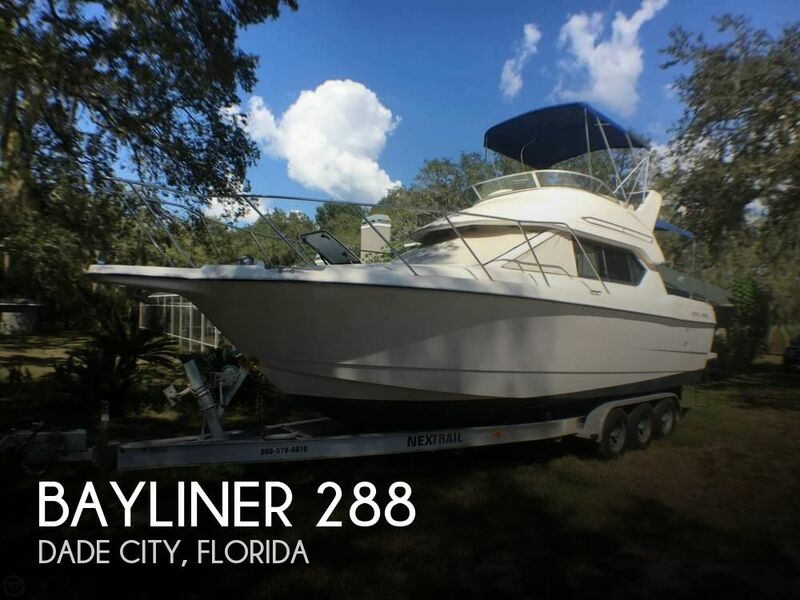 The key factor in determining the maximum capacity for your boat is its square footage. Small boats (under 20 feet in length) use one type of calculation, while medium boats (20-26 feet) and larger sized boats (greater than 26 feet) each have their own formulas for calculating "maximum capacity". The number of people you can have onboard is determined by the total amount of weight your boat can carry. Your boat's total weight includes the weight of fuel, water, and provisions you are carrying, along with the weight of your passengers. The yellow "maximum capacities" label affixed to the helm of your boat will specify the maximum number of people or the maximum weight your boat can carry. Since 1972, the capacity label has been a requirement for all mono-hull boats under 20 feet. 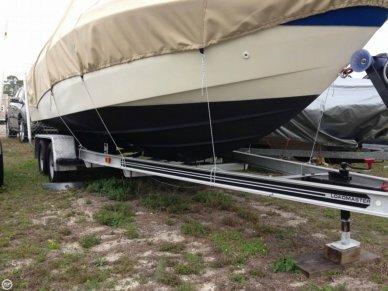 Many boat captains will tell you that, as a general rule-of-thumb, multiplying your vessel's length by its maximum width and dividing that number by 15 (or sometimes 18) will give you the total number of passengers that your boat can safely carry. This simple formula can be used as an estimate, however it is not the technically detailed formula boat manufacturers and builders are required to use to determine person capacity for recreational boats. You can use this simple formula for small, outboard-powered mono-hull boats and for small inboards. However, it should never be used for boats that are more than 25 feet in length; it is simply not applicable to larger boats. The United States Coast Guard (USCG), American Boat and Yacht Council (ABYC), Canada, and ISO all rate capacity for boats under 26 feet based on displacement weight. This is the amount of weight needed to sink the boat and is equal to the boat's volume. If the weight of a boat is less than the fluid it displaces, it will float. To properly calculate capacity, you need to know the maximum displacement. 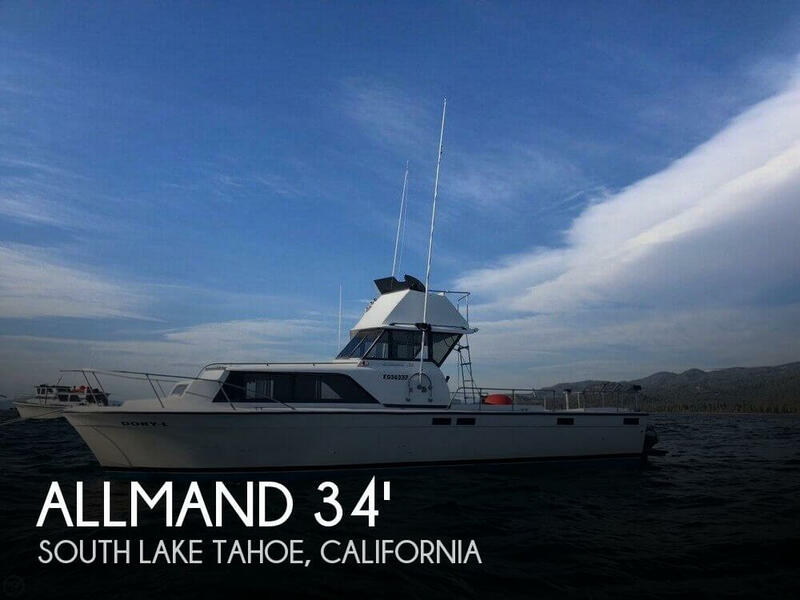 Typically, on boats under 26 feet there will be a label or sticker at the helm that will tell you the displacement weight or you can find it on the sales brochure. However, if you are having trouble finding it on the boat or brochure you can always contact the manufacturer or look it up online. Next, take the displacement of the boat divide it by a number (5 for boats with outboard engines and 7 for boats with inboard engines) and that will determine the maximum safe load. In recent years, the USCG has used 184 pounds as the average weight for a person. You may see 160 pounds used in older books, but recent studies have shown we weigh more today than we did in the past. The ABYC applies this formula for boats under 25-26 feet in length. 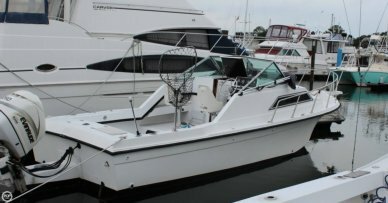 Large recreational boats use "stability" as the criteria for determining capacity. 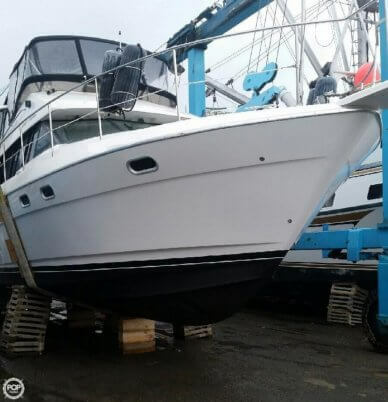 Because these larger boats have been professionally designed, the naval architect or yacht designer will do a stability analysis for the boat. This stability analysis will determine maximum safe load. There are really no standards for passenger capacity other than using your common sense. For larger boats, place a limit (3 to 4 people) on the fly bridge as weight aloft impacts the overall stability of the boat. 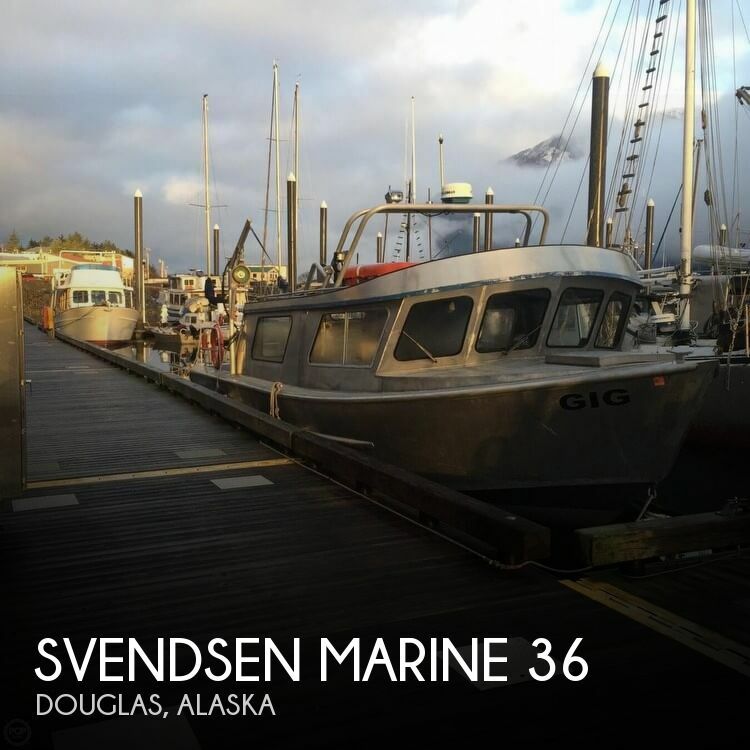 Larger boats obviously allow for more people on the upper and main decks of boats. Because these larger boats can hold far more people than actual seating capability, it is the stability of the boat that becomes the limiting factor for how many people you can have onboard. How Do You Determine "Person Weight"? 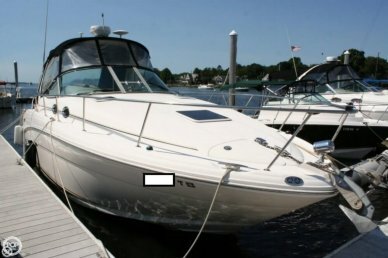 For most boats under 26 feet, the important value is weight, i.e. how much weight can be carried. This takes us back to the discussion of displacement weight of the boat, which is the weight of water displaced when the boat is immersed to the point where water would begin to wash over and enter the boat. Because every boat has a float plane (the line about which water will enter the boat), the volume of the boat below the float plane is used to determine the displacement weight. This volume is equal to displaced water minus the weight of the boat. This same value can be achieved by loading a boat with weight until water comes in. 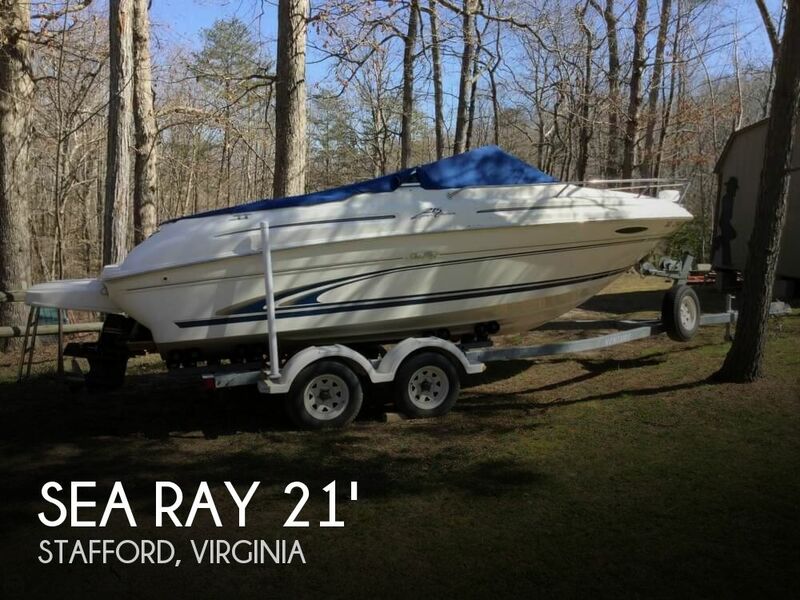 On outboard powered boats under 26 feet in length, we can easily calculate this maximum safe load weight. The amount of displacement weight is divided by 5 to give you the maximum safe load weight. Then you need to subtract the combined weight of the engine, battery, motor, and controls. The number you are left with is called the "person's weight". 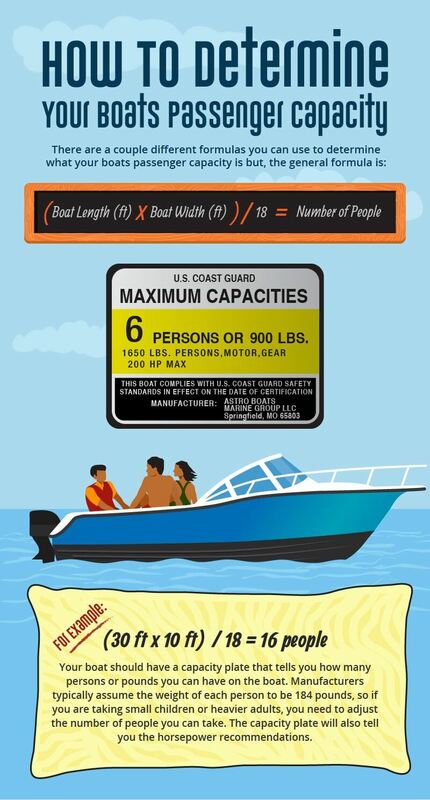 This is the combined maximum weight of all persons safely permitted on the boat. As an example, if your boat's displacement weight is 6,000 lbs, you divide this by 5 to get 1,200. Next, you subtract out the weight of your engine and gear (600 lbs). You're left with 600 lbs, which is going to be your maximum safe passenger load. In theory, if you exceed the "person's weight", you are at risk of sinking your boat, however this figure is a very conservative figure. First of all, it would take 5 times the maximum weight capacity to come anywhere near sinking the boat. So you have a built-in 5x safety factor. Additionally, the values for engine, batteries and controls are based on the heaviest weights of equipment available on the market, not the actual weights. Keep in mind that the addition of a small amount of weight has a much greater effect on stability with smaller boats making the amount of weight a vessel can carry the more logical choice on which to base total capacity. In addition, mono-hull boats less than 26 feet in length are required to have level flotation. That is, if they fill with water, they must float in a relatively level attitude. 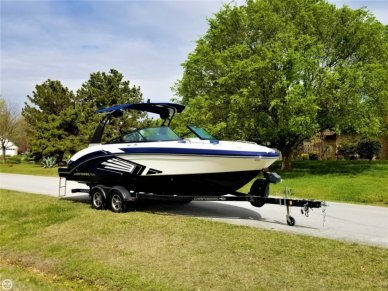 Therefore to achieve level flotation, a boat cannot heel more than 30 degrees to one side or the other when a percentage of the passenger weight is on that side of the boat. If a boat cannot meet this test, flotation must be added or the weight allowed for persons must be reduced. There is a similar process for inboard boats under 26 feet with this calculation. The displacement weight is determined, then the boat, engine, and control weights are subtracted out and the result is divided by 7 (instead of 5, as used with outboard motors). Although not Federal Law, many states have made it a violation to exceed these capacities and most insurance companies discourage exceeding the weight capacities. Please check the state regulations where you boat for the specific law in your area. Please let common sense and the experience of the captain prevail when determining how many people you can have on your boat. And remember, when you are taking a head count of the passengers onboard your boat: it's not the number that counts, it's the weight!